Blink is a nice little app that's really only useful if you have an affiliate account with Apple. It's a way to search for Apple media and quickly create an affiliate link. Let me start by saying that even if you don't have a blog, you should create an affiliate account and generate affiliate links. You'll make some money back on your purchases you make with it. You will also make a few cents when you share it on Twitter and people buy something with the link. No one gets hurt and you get some motivation to share interesting stuff. Blink is simple enough. You search for something and then generate an affiliate link. The formatting of the link can be adjusted and includes customizable Markdown generation. Once the affiliate code is configured, you can set a tracking campaign token too. This is stuff that's only useful if you care about tracking how your links are driven. I created one token for this blog and one for Twitter. In the many years of iTunes affiliate linking, I've never once checked on what was driving links. I'm a terrible businessman. 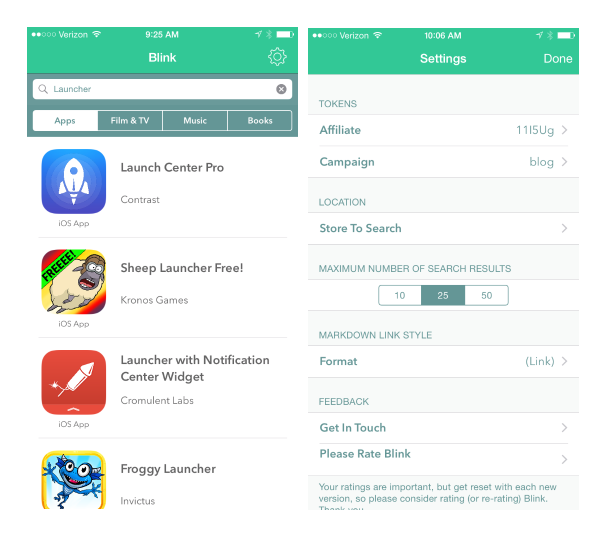 Searching in Blink is faster than the AppStore so, that's already a selling point. The details are nice but lack app previews and other extras. But, the benefit of leaving out app previews is that it's quick to get in and out of Blink. You can always jump back into the AppStore if you need to. It's a very good 1.0 app. It does what it says on the tin. It does it so well, that I want to see some additional features to keep me in the app more. I really want to keep an app wish list in Blink and generate Amazon affiliate links the same way. I doubt searching in Amazon is something available through an API but terrible businessman can dream.